Or de Broceliande or Arbre d'Or is located in the Forêt de Brocéliande. You'll find this Golden Tree by the Miroir aux Fées in the Valley of no Return. The enchanted valley is the domain of Morgan le Fay, the half sister of King Arthur. Locals still believe that the Miroir aux Fées has magic powers. 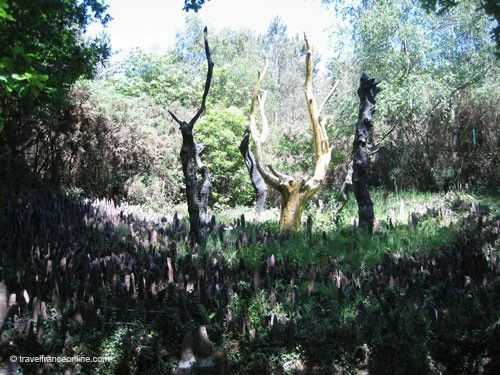 Sadly, magic was powerless against the fire that destroyed this enclave of the Forêt de Brocéliande in September 1990. The fire indeed raged for five days and turned the Valley of no Return into a forest of charred trees. However, donations poured in from all around the world to replant the magical forest. People indeed wanted to keep the legend of King Arthur and his Knights, Merlin the Magician, Vivian the Lady of the Lake and Morgan le Fay alive! A powerful symbol was therefore needed to celebrate the renewal of the forest. The painter Francois Davin suggested to keep 6 charred trees located by the lake, where the fire eventually died. However, one tree had to be magical and survive; so Davin gilded it with gold leaf and named it L'Arbre d'Or or Or de Brocéliande. However, the symbolism goes much further! Indeed, the branches of the charred chestnut are reminiscent of the antlers of Cernunnos, the Celtic God of Nature and Fertility with a stag's head. The five other trees have been left in their charred state as witnesses to the fire. They surround the Or de Broceliande. There are there in order to symbolize the immortality and magic powers of the Forêt de Brocéliande, the resilience of life. You might be surprised to find a multitude of small standing stones around these six trees. Their purpose of this 'mini forest of stone spikes' is to discourage thieves! 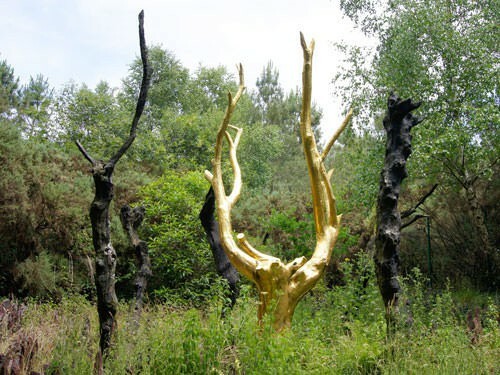 The Association pour la Sauvegarde de la Forêt de Brocéliande, sponsored this unique artistic project. This local association, based in Ploermel, is also in charge of the replanting of the forest. Directions: Leave Tréhorenteuc on the D141 towards Le Vieux Quily. Turn left shortly after exiting the village, there's a small car park. Directions are well indicated. Walk along the farm track that follows the brook Ruisseau du Gué de Mony.